One of the forward bending yoga poses, the Shashankasana is also called the child pose or the rabbit pose or the hare pose as the asana resembles a Rabbit or even a child in a foetal position. ‘Shashank’ in Sanskrit means moon and the moon symbolizes peace and calmness. Shashankasana has a calming, soothing and tranquilizing effect. There are many other benefits of this asana including anger management, relaxation, relieving depression, flatulence. It helps people suffering from diabetes, removing constipation, in asthma treatment etc.. It relax and calms the nerves and brings tranquility to the practitioner. In Yoga, Shashankasana is one of the yoga asanas which is very easy to perform and can be done by anyone regardless of age. Spread a Yoga Mat and sit in Vajrasana (the thunderbolt pose) on it. Keep the palms on the thighs, close the eyes and relax. While breathing in raise the arms above the head and stretch. The arms should be straight and shoulder width apart. While breathing out start bending forward from the hip joint. Keeping the arms straight and in line with the head, bend forward till the head and the forehead touches the floor at the same time. Relax the arms and allow the elbows to rest on the floor. Let the palms be 4-5 inches apart. In the final position, the torso will be relaxed and some part of abdomen and chest will rest on the thighs. The awareness should be in the flow of natural breath. Remain in the final position for 2-3 minutes but without straining, as long as this position is comfortable. While breathing in start raising the trunk, with arms and head in a line. While breathing out bring the arms down and come in Vajrasana, which is starting position. Duration: Beginners should slowly increase the time of holding the final position, starting from ten seconds and reaching up to holding the position for 3 minutes with normal breathing. Those practitioners, who wish to calm the anger and calm the frayed nerves should further increase the time of holding final position to 10 minutes, with normal breathing. People suffering from knee joint problem, very high blood pressure, spondylitis, prolapsed disc or vertigo should avoid Shashankasana. Pregnant women should either avoid this asana or do it under the guidance of a yoga expert. The spine and the back muscles are stretched releasing pressure of the spinal nerves. People with inflammation of the intervertebral joints are benefited. The stretching of the back muscles helps to reduce lower back pain which can be due to overexertion. The Shashankasana strengthens the postural muscles. In the final position, massage of all the abdominal organs takes place, squeezing out the impure blood from the liver, spleen, etc. and replacing it with a fresh supply of blood. The digestion of the practitioner is improved (good for constipation treatment). 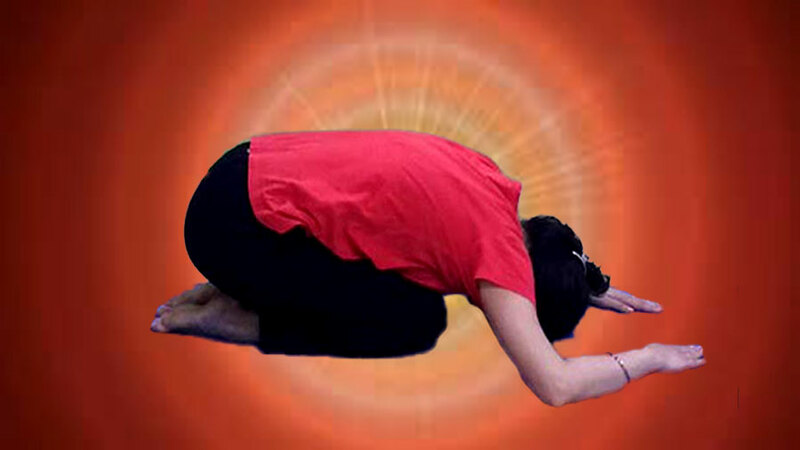 This asana is very good for diabetic patients. The asana encourages deep inhalation and complete exhalation helping people suffering from asthma and chronic bronchitis. For females, the Shashankasana is useful in managing certain gynecological disorders and menstrual pain. This yoga pose is an effective relaxation posture. For children particularly and for other practitioners, the final position of Shashankasana develops a sense of security in them. The asana brings in emotional balance to a practitioner. The regular practice of Shashankasana influence the adrenal glands and the practitioner experiences stress reduction and calmness. It is therefore recommended for controlling frustration, anger, depression, and anxiety. It tones the pelvic muscles and the sciatic nerves. In Shashankasana, the adrenal glands are reactivated to secrete more adrenaline. The excess secretion of adrenaline hormone helps the asthmatic patient at the time of the asthmatic attack. An asthmatic patient can tell very well when he is going to get an attack. He is able to know by his experience that the respiratory congestion has started taking place. The condition begins to accumulate from the morning, and he begins to feel heaviness in the chest. But if he practices this posture he starts to feel better very quickly. The adrenal glands are reactivated to secrete more adrenaline and the attack passes off. The Shashankasana is one of the forward bending yoga poses and should be preceded and followed by a backward bending Yoga pose like Bhujangasana, Ustrasana or Matsyasana.